A Birney is the elemental 1920’s American street car. As such it was not particularly a success, and the last cars operated in the very early 1950’s, with most lost long before the beginning of the streetcar preservation movement which arguably started in 1939. While Birneys are common in museum and heritage railroad collections, most were previously scrapped, and as a result many preserved Birney’s are chicken coops, bodies which at some point were scrapped but have now been saved and returned to service with new trucks, motors and airbrake equipment. Most if not all of the restored bodies don’t use the safety brake valve. Some cars use cobbled together trucks which may not be related to the original Birney trucks. These now operational cars lack the defining characteristics. Is heritage different than historic, and where is the line… Is a Birney defined by the way it is equipped as it would have been in 1920, or by the car body and its architecture as most museums do today. As a veteran of several chicken coops I can attest to a desire on the part of almost everybody I know in the business to want to use the best equipment possible - but a sense of frustration that all they have to choose from is what is available. Make enough new replica trucks, brake valves, etc at cost similar to what is available, and they will be used gratefully. The majority of the visitors don't really care, however - they want to experience the reality of a streetcar ride just like Grandpa did on his way to work every morning. Grandpa probably didn't really care what brake valve was on the car he rode either, he just wanted to get there quickly, cheaply, and reliably. So what is important to creating the experience for our visitors? Personally, I'd trade off a lot of rivet-counter type concerns for the ability to provide the experience in a rich, robust and visceral form, and am much more interested in providing a better context for the experience than in technical details. A city car running down a weed grown museum track out Back of Burke somewhere with the correct brake valve doesn't demonstrate as much about the reality of city streetcars as a city car with the wrong brake valve actually carrying commuters along with tourists down busy city streets. If we can populate those streets with Model T Fords, period storefronts, the sound of ragtime in the background, even better.........think like movie producers, not technical historians. If you produce and market well, you will reap the resources to hire all us technical historians you need to tell you exactly what you are doing wrong. BTW, Birney cars came in more than one flavor and configuration, but I get the point here Randy. I think that anyone seriously interested in PRESERVATION dreams of that one project in their lifetime when a car or locomotive can be restored to mint factory new condition. To get right down to it, that is probably impossible for any number of reasons, so when are compromises acceptable? Probably every project and group has to make those decisions for themselves. Playing the devils advocate a bit, is not it better to get a car alive and operable again? Most of this equipment was modified and changed many times over its service career. Is not a museum 'fix up' just one more evolutionary step along its life? I think the term "reconstruction" should apply to the scenario you describe here. Colonial Williamsburg makes this distinction when interpreting the status of its historic buildings. The original, standing buildings were restored. Buildings that are new construction on a minimal foundation, such as the Courthouse and Governor's Palace. are classified as reconstructed. Given the minimal amount of original fabric in some of the Birney projects, as well as other cars and locomotives (PRR 1361? ), I think the reconstruction label is appropriate. I think the term also more accurately describe the efforts required for these efforts. To operate or to be stuffed, that is the question. To operate you must comply with the rules/laws/etc as they exist today. To be stuffed then you can configure for a condition "as built". Case in point: I am the caretaker for a National Historic Site. The lodge has been restored into original condition except for plumbing, wiring and now must comply with the ADA rules for the bathroom. This will require wider entrance doors to the bathroom and one stall wider than others. We are in the process of figuring out how to retain the original entrance doors and still comply. It is all a matter of give and take. As others have alluded to, I guess it depends on what you're trying to depict. If your intent is to specifically depict a Safety Car, then yes, you would have to put the original equipment back on the car. But if your intent is to depict simply an operational Streetcar, then the safety equipment may not be necessary. I think you hit the nail right on the head! I have often thought that what streetcar museums should do is to give riders a "ride through transit history." Put these riders in a Birney and have them meet in the first block, a horse car coming toward them on the adjacent track from a route in its final days. A turn at the corner and here comes a scene from the 1920's with an approaching car from that era. Another turn at the next corner and here comes a PCC car and the 1940's. And finally, another turn at the corner and here comes a bus or trolley bus, which will be completely replacing the streetcars in a few days. The "four turns" can be accomplished in a relatively small amount of space. And in addition to the street cars coming by, the scenery changes too. A vaudeville theater becomes a silent movie theater then an art deco movie house and then closed a/c television. Likewise, a stable becomes a gasoline station then a service station and then a mini mart. You get the idea. The buildings can be what is done on movie sets (facades only) to keep down the cost. And the entire museum does not have to be this "4 block history story" but at the corners, lines can radiate elsewhere on the property for other "regular" rides, with the cars "on stage" meeting the Birney, going elsewhere at other times. The question; could it/should it, be done? Could, yes - there was a recent post from a gent who was affiliated with the Cincinatti history museum, who have a wonder ful exhibit that takes you from a display of new old machine tools through an inocous door onto a city street at night in 1870 or thereabouts. Gas lights, coblestone streets, brick storefronts, and a steamboat to board down at the landing at the end of the street. It is like a time machine. Sure, it is a small area, and could be improved with appropriate smells, noise, and activity, but the impact for the visitor is very impressive. Line your trolley route with a series of Potemkin villages to reflect different eras - wonderful! I don't care for the term reconstruction very much, but I do follow Wesley's reasoning. To rebuild on the original foundation would be to reconstruct. A street car body is not a foundation however. It is the major part, to which all associated parts are attached. If the car body survives, it is my opinion that the car survives, it can then be restored to its former appearance with the attachment of the missing parts. Admittedly, many of the parts are sometimes not available. But when have you ever "finished" a restoration? There always seems to be something that will finish a project that is left to the future. Maybe all of our projects should be labeled "restorations in progress." Hopefully the docents at your museum can explain to the visitors who ride on a restored service car what it takes to give them the experience. Recruitment of future restoration workers might even pick up. We could all benefit from that. I think that a distinct set of categories need to be established for the treatment of historic railroad equipment. We all agree that the treatment standards for traditional museum artifacts are not appropriate for operating historic equipment. These categories could be developed by ARM and included in future editions of their recommended practices. Williamsburg was mentioned before in reference to the differences between preservation vs. reconstruction. The world of architectural preservation actually relies upon four different treatment strategies that have been recommended by the Secretary of the Interior. Buildings are expected to last for a long time, but are also required to do so in a manner that is safe for the people that use them. As codes change, buildings are modified over time to reflect current codes that are intended to protect people's lives. Also, as buildings are generally located outdoors (duh), it is expected that they will require maintenance that will result in the destruction and replacement building components. In other words, there are reasonable approaches that allow buildings to be maintained and protected. The following is from memory, so please forgive me if I get something wrong. Decay and structural problems are addressed to conserve the building in its present state towards the aim of preserving all of its fabric as-is. This treatment removes or reconstructs portions of a building in an effort to re-create the appearance of the structure during its period of historic significance (Period of Significance). Restoration work is supposed to be based upon documentation and not speculation. Contemporary construction technologies are allowed as long as a reasonable effort is made to accurately represent the historic details and materials. For instance, double-glazed windows can be appropriate if the frames reproduce the details and appearance of the originals. More severe changes to the historic fabric can be introduced when the building must be adapted to a new purpose and to meet current codes such as the ADA -although many states have laws that limit the effects of current laws on recognized historic structures. Renovation work should be designed to limit its impact on the historic fabric, and when possible should be made reversible, but can include moving interior walls, installing modern HVAC systems, improving accessibility, and structural retrofits. This is the last resort and should only be undertaken when the existing building is too far gone, or there is sufficient evidence to design a reasonable facsimile of a no longer extant historic building. As a new building, a reconstruction is subject to all current building codes. I believe that new categories similar to these could be developed for the treatment of historic railroad equipment. Needless to say, these approaches should be applied to the treatment of preserved railroad architecture such as depots and maintenance facilities. Choosing the appropriate treatment comes from undertaking a preservation planning process similar to the process Brother Hees brought up in a recent thread. I am currently involved in a depot reconstruction project here in California. Last edited by Randolph R. Ruiz on Thu Jan 31, 2008 2:25 am, edited 1 time in total. I realized I needed to add something to my previous post. It slipped my mind at the time, but I believe that technically, the Secretary of Interior Standards for the Treatment of Historic Structures (referred to in my previous post) applies to railway equipment as well. There are several categories of things that the NPS and the Department of Interior have developed standards for. A piece of railway equipment is considered a Structure in the same category as a historic building. The other categories are Objects, Landscapes, and Districts. I still believe that some work needs to be done to both adapt the Sec. of Int. Stds. to railway preservation, and to disseminate that information within our movement. For those of you that do not know, the Sec. of Int. Stds. describe the established approaches for all preservation and preservation planning for buildings, districts, and landscapes that involve any state or federal funding. These standards are very much applicable to railway preservation. More information can be found at the NPS website Here. In a related matter, how many of you out there have experience with nominating railway equipment to the National Register of Historic Places? Our Restoration Philosophy and guidelines are under development. They began as a set of notes for a presentation at the ARM convention in Riverside California. Since then they have been edited and enlarged. They consist of five parts, a Restoration Philosophy, a set of Restoration Guidelines to be considered during the course of a restoration, to guide the many decisions which must be made, and our Restoration Process, a discussion of the phases which any restoration goes through. This philosophy and guidelines statement has not been formally adopted by the SPCRR but an earlier version has been posted to the group’s web site. Additionally there is a discussion of the Secretary of the Interiors Guidelines for Historic Rehabilitation, and a list of Terms used. c. An evaluation and justification for the level of each object's use for display, operation, etc. Our restoration philosophy consists of a series of statements. 1. We are preservation organization, and preserving the artifact comes ahead of all else. a. Restoration can be interpretation. b. Restoration can be research. c. Preserving skills and knowledge used to produce the artifact is as important as preserving artifacts. d. Restoration is not a stand alone activity. e. We learn from the restoration process. documented. Each restoration will be documented in a Restoration Report. Significant material removed during the restoration will be retained, cataloged and preserved in the organizations archives. 4. Equipment is restored to operate if possible, but we may choose not to. 5. All members must understand that a policy exists. 3. We try to not just copy, but instead understand the device, part or finish. a. The pre-restoration report will include a target date, including a discussion of options, and a fact based discussion of each and information to justify the decision. b. You do not have to take it back all the way to its as built appearance, nor do you have to restore it as it currently appears. You may choose an interim date. It is possible that you will chose to preserve a car as a building or other non railroad use. b. You will chose to removing updates or replace newer parts with older based on these decisions. c. Restoration target decisions may not be rational. d. Remember to let the artifact be what it wants to be. 6. Now that you have restored it what are you going to do with it? c. The research never ends. a. Remember that restoration will erase texture. b. Consider heroic efforts to preserve original material including epoxy or other materials to consolidate original parts or finishes. Consider preserving old parts separately from the car, either in the archival storage area or as a display to be presented as an interpretive presentation. researchers to consume using better research techniques. a. Locate and reinstall or at least preserve the original. b. Identify missing original details and accurately replicate them. c.	If the original can not be specifically identified, then base the replacement on similar parts or finishes, used on objects with similar history of origin, and use. d.	Use a functional, appropriate contemporary part or finish. f.	Be prepared to replace the “make do” part when research suggests a better alternative. 9. Documentation. When restoring, or considering restoring an object we must keep detailed records of the process including work done, decisions made, a restoration log, along with supporting documentation. The standards for documentation are included as an appendix in this document. Phase 1, Acquisition, transport and stabilization. This is typically expensive, particularly the transportation. Stabilization varies greatly from car to car, and can include tarps, blocking, sealing openings, cleaning, or treatment with anti fungal agents. Frequently the least expensive, and in reality a phase that never ends. Tasks include paint sampling, photo documentation, Drawings, and historic research. Usually a part of phase 2 above. This phase is frequently revisited as the car progresses. This phase includes paint removal, removal of later modifications, removal of deteriorated material, but also disassembly of portions of the car which we will later reassemble and/or install as part of the finished car. The process of remaking parts, and reassembling the car. Phases 4 and 5 frequently take place either simultaneously, or cyclically. At some point late in phase 5, we have an artifact which can be operated, displayed, and may appear to be complete. It can be difficult to determine where phase 5 ends and phase 6 begins. Our projects, while appearing complete rarely are. There may be tasks left undone, tasks which we chose to ignore during phase 5, or make do aspects of the restoration which need to be revisited. There is always documentation to finalize. The car enters the public realm. What stories do we tell about the car? How do we use it, where does it live? Do we need signage or other interpretive materials? This phase is subject to change. Ongoing care related to wear and tear or use. This includes storage, preferably inside, and as a result can be expensive. I am not familiar with the ADA rules as they apply to hitoric buildings and structures. But, in the case of rail cars, we are exempt from ADA accessibility requirements because of the historic nature of the vehicle. This is not to say that we can make some provisions to get handicapped persons aboard our cars and many of us do that. I am somewhat surprised that a historic structure would not also be afforded this same "protection," especailly when it would require modifications to the structure itself to comply. The ADA made it a Civil Right that the disabled should have equal access to public places and private businesses. There are federal guidelines for acceptable standards of accessibility (Americans with Disability Act Accessibility Guidelines, or ADAAG), but most regulation takes place at through state and local laws which tend to vary. No one is "exempt" from the ADA. The act recognizes alternative requirements when modifications would threaten the structure's significance. Determining what is historically significant, and what alternatives are acceptable usually requires consultation with building officials and possibly your state SHPO. Many architects provide ADA consulting services. Every organization needs to take the ADA very seriously. If your primary program is the operation of an interpretive passenger train, you really need to provide some manner of equivalent accommodation on the train. If that is not possible, you are expected to provide some other form of "access" which has been interpreted to include audio-visual programs. 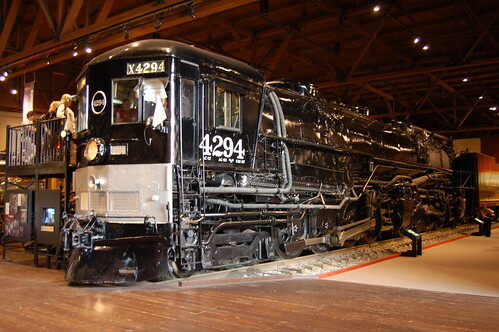 The California State Railroad Museum allows supervised visits to the cab of their cab-forward locomotive. Since the door into the cab is too narrow for wheelchairs, they have provided a live video monitor that shows the inside of the cab at the base of the stairs. I do not remember, but I think there may be a lift to get the disabled up to the level of the cab. Congress, in their infinite wisdom, agreed that ADA enforcement could be achieved through civil lawsuits. Any disabled visitor can take your organization to court if they feel their civil rights have been violated by your failure to provide equal access. 1) Making the main or a prominent public entrance and primary public spaces accessible, including a path to the entrance; 2) Providing access to goods, services, and programs; 3) Providing accessible restroom facilities; and, 4) Creating access to amenities and secondary spaces. ADA is indeed something that all tourist railroads and museums must take seriously. As an historic operation, you may not have to modify certain pieces of historic equipment under certain circumstances (such as not for profit versus for profit/repaired or restored versus rebuilt equipment). However, the general intent is that within reason, all services/facilities must be accessible to all patrons. You might win a lawsuit regarding ADA, but not without a significant investment of time and money. Here in Tucson, we are having to consider how the heritage streetcars will comply with ADA once it becomes part of the regular transit system. Based on Federal Transportation Authority guidelines, the cars will have to be operated along with ADA compliant cars in something like a one to two ratio in order for us to operate without having to install lifts.